Plaster is a thin layer of mortar applied over the masonry surface and it acts as a damp-proof coat over the brick masonry work. Plastering also provides a finished surface over the masonry that is firm and smooth hence it enhances the appearance of the building. 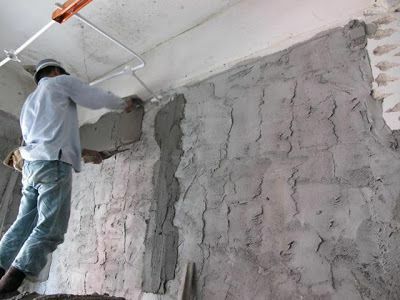 The primary objectives of plastering are to protect the surface from atmospheric influences, to cover the defective workmanship in masonry, to conceal porous materials, and to provide a suitable surface for painting. 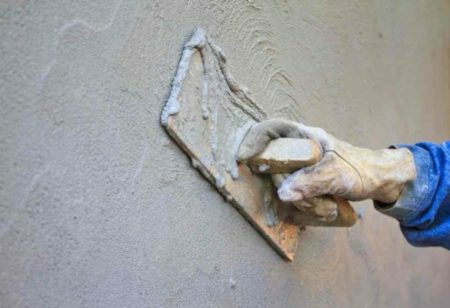 Keep all the mortar joints of wall rough, so as to give a good bonding to hold plaster. Roughen the entire wall to be plastered. Clean all the joints and surfaces of the wall with a wire brush, there should be no oil or grease etc. left on wall surface. If there exist any cavities or holes on the surface, then fill it in advance with appropriate material. If the surface is smooth or the wall to be plastered is old one, then rake out the mortar joint to a depth of at least 12 mm to give a better bonding to the plaster. Wash the mortar joints and entire wall to be plastered, and keep it wet for at least 6 hours before applying cement plaster. If the projection on the wall surface is more than 12 mm, then knock it off, so as to obtain a uniform surface of wall. This will reduce the consumption of plaster. In order to get uniform thickness of plastering throughout the wall surface, first fix dots on the wall. A dot means patch of plaster of size 15 mm * 15 mm and having thickness of about 10 mm. Dots are fixed on the wall first horizontally and then vertically at a distance of about 2 meters covering the entire wall surface. Check the verticality of dots, one over the other, by means of plumb-bob. After fixing dots, the vertical strips of plaster, known as screeds, are formed in between the dots. These screeds serve as the gauges for maintaining even thickness of plastering being applied. 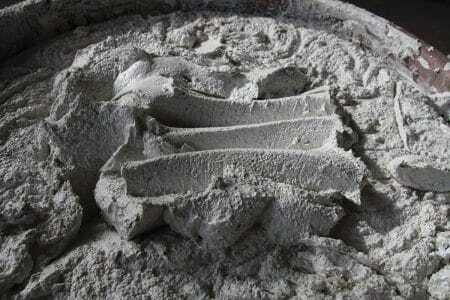 Fig 2: Mixing of cement and sand for plastering work. In case of brick masonry the thickness of first coat plaster is in general 12 mm and in case of concrete masonry this thickness varies from 9 to 15 mm. The ratio of cement and sand for first coat plaster varies from 1:3 to 1:6. Apply the first coat of plaster between the spaces formed by the screeds on the wall surface. This is done by means of trowel. Level the surface by means of flat wooden floats and wooden straight edges. After leveling, left the first coat to set but not to dry and then roughen it with a scratching tool to form a key to the second coat of plaster. The thickness of second coat or finishing coat may vary between 2 to 3 mm. The ratio of cement and sand for second coat plaster varies from 1:4 to 1:6. Before applying the second coat, damp the first coat evenly. Apply the finishing coat with wooden floats to a true even surface and using a steel trowel, give it a finishing touch. As far as possible, the finishing coat should be applied starting from top towards bottom and completed in one operation to eliminate joining marks. After completion of the plastering work, it is kept wet by sprinkling water for at least 7 days in order to develop strength and hardness. Use of gunny bags or other materials is used to keep the plastering works wet in external works. Improper curing may lead to cracks formation or efflorescence in plaster work.